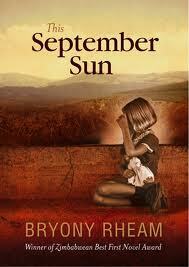 I first heard about This September Sun around the middle of last year on one of my many missions to discover new reads. It was published in 2009 by amaBooks, an independent Zimbabwean publisher. Unfortunately, I had no idea how to get it so I forgot about it and went on to the next one. Imagine my joy at discovering that Parthian Books (an independent UK publisher) are launching it in the UK. The official launch date is May 2012. Obviously I'm happy because it means I'm now one step closer to finally reading this book (you will be surprised how difficult it is to get a book written by a Zimbabwean (or any other African) author in Nigeria). Other than my own personal (and selfish) reasons, it's also just great to know that bit by bit contemporary African literature is becoming more accessible and available in certain places outside of Africa, especially one that was first published by an African publisher. Ellie is a shy girl growing up in post-Independence Zimbabwe, longing for escape from the confines of small-town life. When she eventually moves to Britain, her wish seems to have come true. But life there is not all she imagined. And when her grandmother Evelyn is brutally murdered, a set of diaries are uncovered – spilling out family secrets and recounting a young Evelyn's passionate and dangerous affair with a powerful married man. In the light of new discoveries, Ellie begins to re-evaluate her relationship with her grandmother, and must face up to some truths about herself in the process. Set against the backdrop of a country in change, Ellie – burdened by the memories and the misunderstandings of the past – must also find a way to move forward in her own romantic endeavours. I remember seeing a review of this one. Glad to hear it's getting a UK publisher - may make it easier to source in Canada as well!